Though their lineup has spawned a beautiful array of cars and SUVs let’s face it; the wagon is the quintessential Volvo. Joining the impressive flagship V90 is this all-new V60; a smaller, sportier take on what Volvo does best. Several years back it appeared as though Volvo had all but given up on their wagon endeavors. But then the all-new V90 arrived to restore the faith and now the rebirth of one of Volvo’s oldest cars, the V60, keeps the line moving. The new 60 Series models mirror everything the Swedes have been up to since the current generation XC90 debuted 3 years ago. The harder edged exterior styling is a resounding success across the board. But Volvo’s Scandinavian-styled, beautiful yet simplistic cabins are all so similar to one another that it’s difficult to tell them apart, making it easy for the Volvo faithful to transition from one model to another but inducing a serious case of Deja vu for the rest of us. At least here in this entry-level Momentum trim you can specify these fashionable City Weave Textile seats which provide some distinction and always start a conversation. Personally, I love them. And these seats don’t just look cool; they’re super comfortable with a perfect blend of softness and support. Dimensionally, the V60 keeps things status quo, so it continues to be low slung with generous luggage and passenger volume. It’s one of those cars that’s bigger inside than it looks. Being low to the ground has its advantages, particularly when loading and unloading the cargo area which is both clever and spacious. Providing cubic feet that exceeds the XC40 SUV, the V60 gobbles up more than you’d expect and includes a couple of retaining straps, tie downs, underfloor storage, a cargo cover, rear seat pass through and electronic switches to fold the rear seats. Its small wagon credentials are solid, but because it’s so low to the ground getting in and out requires a little more effort than you might be comfortable with. The V60 starts at about $40,000, available like this in Momentum livery, or in sportier R-Design and lavish Inscription trims – the first 2 available in either front- or all-wheel drive while the Inscription comes only in AWD. The front-drive T5 models come with a 250 horse turbo-4 while AWD V60s run with a very energetic 2.0-liter motor that is both supercharged for low-end torque and turbocharged for a smooth and linear 316 horsepower. This car has always had a sporty driving demeanor, but I personally had never driven one with the T6 powertrain, which allows this car to hit 60mph in the mid-5 second range, more than quick enough to satisfy the need for speed. Surprisingly there are no paddle shifters but the 8-speed auto plays well with an available sport mode that’s eager to keep the momentum moving quickly. And while is seems a little gauche in the flagship S90 sedan, this engine sounds and feels very appropriate here, producing more pleasing acceleration sounds than I recall in other models. But I never did get to the EPA’s 25mpg number for mixed driving; my mileage was a lackluster 19 and that’s on premium gas. A smaller tank also reduces the total driving range to under 400 miles. Everything good about the previous generation V60 has been dialed up here. The cabin’s makeover is really well done with just right seats, all of Volvo’s latest infotainment and safety tech and an even faster, more athletic driving experience. Not to worry though, Volvo hasn’t forgotten how to balance their suspension tuning for a combination of beautiful ride and fun handling. 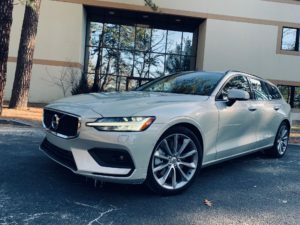 Thanks to the optional FOUR-C Active Chassis, the V60 adapts its ride personality based on the various drive modes from softer to firmer, but even on these optional, larger 19” wheels and tires the sumptuousness of the suspension is never in question. It rides like a Volvo and that’s the biggest compliment you can pay it. I’m not sure if I’m just imagining it but the computer processor seems faster and so the laggyness experienced in other Volvos isn’t an issue here. And having spent considerable time with this complex system in a number of their models over the years, I’m pretty proficient in getting around and finding what I want. But keep in mind; new owners are going to have to spend some time in their garages or driveways with this before they’re comfortable. Unlike jumping into a GM or Hyundai and immediately getting up to speed, Volvo’s setup is not very intuitive. I wish there was a wireless charge pad for my phone and more actual buttons for items like the heated seats, steering wheel and 360 degree camera. Premium, Advanced and Multimedia Packages add the good stuff including Volvo’s Pilot Assist system which can do some of the driving for you, a head-up display and blind spot warning which should absolutely be standard equipment. This loaded Momentum model comes in at an Inscription price of $54,690. Too much for you? Consider the Buick Regal TourX. Otherwise, the V60 is the new Volvo at its continued best.